A cartoon by Roger Lewis of the School of Architecture in the first issue of the Voice. Lewis did acknowledge the planning and architectural challenges for a campus the size of a medium sized city with an equivalent infrastructure, need for changes, and an uncertain physical identity. And he provided historical and functional reasons for the campus he experienced as “whole sections of uncharted territory.” My 1990 impressions accorded with most of his: that except for a well ordered and quite lovely center in McKeldin Mall and the sweeping lawns facing Route 1, most of the rest was unattractive. But, far more importantly, in the intervening twenty plus years, we have addressed a number of the deficiencies Lewis described. Things got better. The process guiding components Lewis called for are now in place. There are nine District Plans based on subsections of the campus intended to identify, reinforce and/or create a “sense of center and community focus” and “neighborhood.” We have design guidelines linked to both the campus as a whole, its “landscapes” and its “neighborhoods” or Districts. These documents can be found on line (www.facilities.umd.edu/). Indicating master plan or aesthetic guidelines will get you to them. We have created a design review committee intended to support these guiding documents in two ways; to understand what Lewis meant by the “conceptually three dimensional…orderly and form giving” principles and goals the District Plans contain, and to encourage either a re- strained or robust architectural interpretation of the nascent architectural language of the campus appropriate to each district and the campus as a whole. “The formation of campus edges – the university’s face to the outside world – and entrances,” are two areas that have undergone considerable transformation, a description of which addresses the question, “What can you point to as improvements?” One of these is the Stadium Drive Entrance to campus now inclusive of Denton Dorm, Clarice Smith Center for the Performing Arts (CSPAC), the Stadium Parking Garage, and Riggs Alumni Center. The other is most of the cam- pus edge along both Knox Road and Mowatt Lane that now includes the South Commons Dorms, the Mowatt Lane Garage, the Business School and the newest and adjacent mall and quad on campus, Mayer Mall and the quad in front of Prince Frederick Hall. What brought about these transformations? The upper administration did have serious concern for “campus edges – the university’s face to the outside world – and entrances”. That concern was the basis for exceptional decisions and processes that cumulatively led to what is experienced today. In 1990, the Stadium Drive entrance was heralded by not much more than a traffic light on University Boulevard. The view into campus was framed on the left by Denton Hall’s large pinkish facade that directed your eye to a chain link fence running around the backside of Bryd Stadium’s bleachers. Immediately to the right was an un- kempt swath of grass known as Den- ton Beach and a large athletic field. The entry road led to the vast asphalt Lot One parking area. An international competition to select the architect required the competitors to include a master plan for the entire west campus. The master plan by the winning team, Moore Rubell Yudell (MRY) associated with Ayers Saint Gross (ASG) incorporated and integrated earlier plans that had logically extended the McKeldin Mall/Ann Arundel/Tawes organizational axis to the Inn and Conference Center. The great innovation of the MRY/ASG plan was to complement that east-west axis with a north-south cross axis stretching from Campus Drive across the face of Tawes all the way to the circle now in place in front of Performing Arts and the Stadium Garage. That axis included a long narrow green, a unique space that would give identity to the entire area. This north-south green would be defined by future buildings. It would tie together otherwise disparate parts of the campus core and link them to the core east- west campus axis. Their scheme exemplifies the kind of 3D thinking Lewis encouraged in his article, “impose an enduring com- positional idea on the landscape, a recognizable and memorable idea manifesting itself geometrically, spatially, and architecturally.” So far, this “compositional idea, has contributed to the shape of CSPAC, guided the process of locating the Stadium Parking Garage, the Riggs Alumni Center, the Knight School of Journalism, and an unseen but major piece of infra- structure. No matter how compelling, such ideas can be overrun by expediency or compromised by unexpected challenges—most recently by the necessary accommodation of the Purple Line. But the Stadium Drive entrance faced a difficult challenge in its making. How it was handled might be instructive to finding an optimal solution for the presumed Purple Line conflict with the proposed north-south axis and green. As the Stadium Drive entrance got underway, the construction of the unsightly south facing new stadium visitor stands unexpectedly appeared, a potential blemish on the developing new “face” of campus. Performing Arts project architect, Ted Ariev, demanded a brainstorming session involving three consulting architecture firms working these two big projects. The resulting design solution: wrap a required parking garage around the unsightly Stadium bleachers to create a visual screen shielding the bleachers and at least some of the tall visitor stands from the view up Stadium Drive and make a focal point at the head of Stadium Drive by creating a ceremonial entrance to the Stadium. I hope the Purple Line threat to the north-south axis and green will be similarly resolved. The Purple Line goal of connectivity to the larger region should not result in the irony of disconnection rather than connection in this developing campus neighborhood. Aerial view showing intended axial vistas to Ann Arundel, Memorial Chapel and to Hartford hall in Washington Quad. The second area of campus that has undergone significant transformation is the “campus edge” along Knox Road and Mowatt Lane. In 1990 the Knox Road edge presented a rag-tag mix of small leftover buildings and parking lots. Along Mowatt Lane, the Architecture Building and Van Munching (Business) looked across an intervening swath of abandoned weedy tennis courts, rusty chain link fences, parking lots, and single story WW II temporary buildings toward a campus that seemed distant and removed. 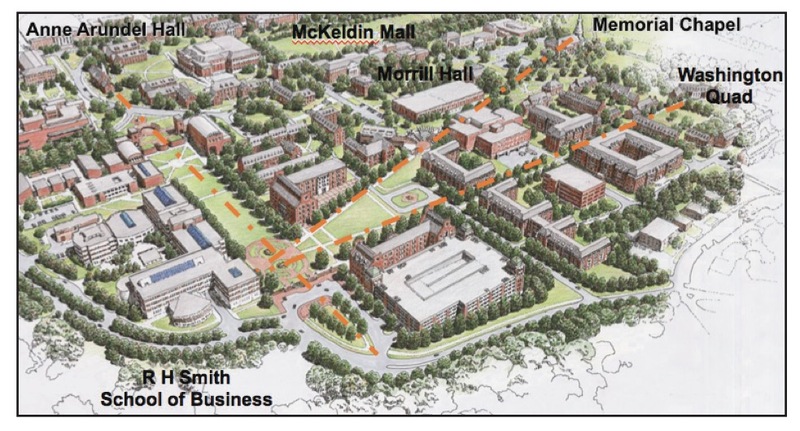 The many elements that contribute to giving the area the cohesive quality it has today were guided by three fundamental ideas; (a) improve the campus edge; (b) create a mall or quad to link Architecture/Business and other future buildings to campus while giving them a shared “neighbor- hood” space; (c) make new campus walks connecting to other major parts of campus, north-south and uphill to- ward Ann Arundel and Tawes Plaza and as well as a walk stretching from the Business School to Washington Quad. Studying the Knox Road edge was first suggested by Brenda Testa, Director of Facilities Planning. Bill Mallari of Testa’s staff and I imagined that dormitories could be t snugly into the narrow space between the existing dorms and Knox Road. A detailed study led by Associate Professor Matt Bell proved the case. Vice President Charles Sturtz extended the project to include replacement of the WWII temporary buildings. The final design by Design Collective created the Commons dorms that now de ne and embellish the cam- pus edge along Knox Road, include a picturesque gateway “entrance” that frames a vista to Memorial Chapel, and defines a major section of the campus walk between the Business School and Washington Quad. Meanwhile, two additions to the Business School were improving the campus “face” along Mowatt Lane. An early Business School scheme had nearly obliterated the potential of Mayer Mall, but was redirected to form the courtyard facing Mowatt Lane. Fundamentally, it was the commitment to build the Mowatt Lane Parking Garage that has made possible nearly all other development in the area. It replaced the surface parking that once consumed the ground now devoted to Mayer Mall, Prince Fredericks Hall, the adjoining quad between Prince Fredericks Hall and the Mowatt Lane Garage, and the garage itself. This plan could not have become a reality without significant support from the upper administration. Walking with then Provost Gregory Geoffroy, we stopped at the top of the hill on Cam- pus Drive looking down over those abandoned tennis courts and parking lots. I pointed out the potential of a North-south quad or mall in the area and aligning it with the cupola rising from Ann Arundel Hall. Geoffroy immediately grasped the organizing principle likening the McKeldin/Ann Arundel/Tawes axis to the nave of a church and the proposed mall or quad to the church’s transept. Coincidentally, parking garage studies were underway. I had argued in favor of peripheral and smaller garages as opposed to large centralized garages that, like Regents Lane Ga- rage, result in pedestrian-auto conflicts. The administration seemed to see the transformative potential for the area by coordinating these several building projects. Top to bottom administrative support has created the “enduring compositional idea… recognizable and memorable,” we see today. Together, the two spaces visually tie the new “neighborhood” back to the core of campus. Mayer Mall provides that clear north-south link uphill to Ann Arundel Hall, Tawes Plaza, and the campus’s east-west organizational axis. The donations of Robert Smith have made the area among the most attractive landscapes on campus. The new quad in front of Prince Frederick Hall was shaped to provide vista to the steeple of Memorial Chapel, a visual connection to the South Dining Hall, LeFrak, and at least a conceptual link to the campus’s oldest building and quad, Morrill Hall and Morrill Quad. Rendering diagramming the future Mayer Mall vistas to Ann Arundel, Memorial Chapel and Washington Quad with Mowatt Garage, South Commons Dorms, and the location of Prince Fredericks Hall. These two examples of significant and well-ordered changes to campus are the largest and most complete of numerous studies undertaken jointly by Facilities Management staff, Architecture School faculty and various consultants, but hundreds of other studies and decisions taken jointly have similarly had positive impact on the campus. They are testament to the kinds of improvements that can be made when there is a vision and willingness to “impose an enduring compositional idea on the landscape, a recognizable and memorable idea manifesting itself geometrically, spatially, and architecturally.” And when there is a constancy of allegiance to the value of “enduring compositional ideas” as well as the patience to re- solve differences between what often seem completely contrary, shifting, and competing visions for the campus. President Wallace Loh has slashed the Gordian knot that seemed to pre- vent the transformation of the Route 1 suburban strip development into a more urban mixed use environment inclusive of housing supporting the campus. Previous administrations have lamented our immediate environment. Following on a Route 1 Sector Plan of some years ago that provided the basis for critical changes in zoning was a first step. But Loh’s successful appeal to the University’s foundation that its real estate investments could be used locally to good effect has been transformative. This is all to the good, as is the expected Purple Line. However, I hear Loh propose a radical change in how we think of the campus, contrasting the “bucolic campus of the past” with an “urban campus of the future.” We should not be led by simplistic characterizations to think we cannot achieve an integration of landscape and building scape, of the bucolic with the urban. Instead we should be looking to the best of our urban and landscape traditions represented by such things as Central Park in Manhattan and the Mall and Rock Creek Park here in DC. Imagine making a more holistic connection of neighboring landscape environments, the Campus, the Paint Branch that runs along our entire northeast edge, Lake Artemesia, and Greenbelt Park. Connecting these landscapes has real potential. If eco- logical awareness is to become central to our thinking, what is now the wooded flood plain of the Paint Branch stream could become a new park-like center for the campus and for College Park binding together these three significant landscapes as instructive and enjoyable watersheds, habitats and recreational areas. Imagine a most ideal town-gown face along Baltimore Avenue. It would preserve the sweeping lawns and views into the “bucolic” campus. It would make a most pleasant “urban” street on the opposite face, a tree lined wide sidewalk set back from the traffic lanes, shops and shop windows nearly the entire way, a mix of office and residential above the shops making a reasonably unified and nearly continuous façade of buildings. Imagine the walking experience stretching from the South Gate at Regents Drive/College Avenue all the way to the Founders Gate at Paint Branch, the “bucolic campus” reflected in shop windows. Ideally, a sheltering colonnade would stretch the entire distance excepting for two interruptions, one caused by the new hotel, the other to maintain the vista of Memorial Chapel that ex- tends into Fraternity Row, a framed vista to Memorial Chapel that could be extended in the future all the way to the intersection of Rhode Island Avenue and Paint Branch Rd, where there is now a traf c signal in support of the pedestrian use of the old trolley car bridge over the Paint Branch flood plain. Properly developed, our campus could have the best campus “face” among most and possibly all US Campuses. This entry was posted in Archives, Education, Features, News, People/Places. Bookmark the permalink.